The girls have been into bobas or pearl tea drinks lately so they’ve been having me cook pearl pearls for their concoctions. I had cooked a little too much tapioca pearls for their needs one time so rather than having them sit in the refrigerator, I decided to make tapioca pudding. But since they are not the usual dainty little pearls normally used for tapioca pudding, I decided to change it up even more.First though, here is how I’ve been boiling tapioca pearls. You can buy tapioca pearls at most Asian market. Don’t get the pre-cooked or ones that claim to be ready in five minutes. I don’t know about you, but I haven’t had a good experience with those. They usually turn to glue. So here goes how to cook tapioca from scratch. 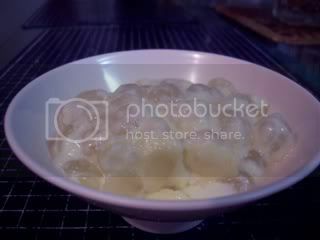 Boil about a gallon of water per cup of raw tapioca. Add the tapioca balls to the boiling water, stirring so they don’t fall to the bottom of the pot or stick together. Cook for fifteen minutes at a full boil. Turn off the heat and cover the pan. Leave it for a couple of hours or until the water cools to room temperature. Stir the pearls. You’ll notice that there will still be a white center. If it looks like too much water has evaporated, add more so there is enough to float the tapioca pearls. Bring the water back to a boil, stirring agains so they don’t clump together. Turn off the heat again and cover. Leave until it comes back to room temperature again. By this time, your tapioca pearls should be done all the way to the center. You can drain them and rinse and store them at this point covered with fresh water or use as you will. Mix all the ingredients except the tapioca pearls in a pot and heat through over moderate heat, stirring constantly until it starts to thicken. Add the tapioca pearls and pour the whole thing in an oven safe dish. Put in a preheated 300° F oven and bake for 1½ to 2 hours. Cool and serve. Although it is also good served slightly warm.